Oral submucous fibrosis (OSF) is a chronic progressive and irreversible disease affecting the oral, oropharyngeal, and sometimes the esophageal mucous. OSF is a disease that causes changes similar to those of systemic sclerosis (scleroderma) but limited to oral tissues. The disease is seen in those from the Indian subcontinent and from many parts of southeast Asia such as Taiwan., In 1952, Schwartz discovered a disease in five Indian patients. He called the disease “atrophia idiopathica mucosae oris.” The same disease was described by Pindborg and Sirsat as an insidious, chronic disease affecting any part of the mouth and, sometimes, the pharynx. It causes significant morbidity (in terms of loss of mouth function as tissues become rigid and mouth opening becomes difficult) and mortality (when transformation into squamous cell carcinoma occurs). The introduction of chewing tobacco containing areca nut into the market has been associated with a sharp increase in the frequency of OSF. Here, three cases of OSF are reported, highlighting the effectiveness of intralesional injection in the management. A 22-year-old male patient reported to the department with a burning sensation in the mouth and difficulty in mouth opening [Figure 1]a. He gave a history of areca nut chewing for 5 years. He consumed 6–7 packets for 5 years. He had no other habit besides chewing tobacco. He did not give any significant medical or dental history. On intraoral examination, blanched appearance of the oral mucosa was seen. The mouth opening was significantly reduced (measuring 18 mm) and pseudomembranous slough covered the buccal mucosa bilaterally. The hard and soft palate were pale and blanched and the uvula was shrunken. The tongue protrusion was significantly reduced. When the patient was asked to blow out air with closed lips, the usual puffed cheek appearance was not seen, suggesting loss of cheek elasticity. General examination was normal. Based on clinical examination, a provisional diagnosis of OSF was made (Stage 3). The patient was treated with biweekly intralesional injections of corticosteroids (2 ml), hyaluronidase (1500 IU), and local anesthesia (2 ml). The patient was advised capsules of lycopene 1500 mcg and mouth opening exercises. His mouth opening significantly increased (measuring 28 mm) and the burning sensation gradually reduced. He was on follow-up for 6 months after the intralesional injections but was lost to follow-up thereafter [Figure 1]b. A 35-year-old female patient reported to the department with the chief complaint of burning sensation in the mouth and reduced mouth opening. She gave a history of chewing areca nut 8–9 times/day for 10–12 years. She did not give any significant history of any medical history. On intraoral examination, fibrous bands were palpable bilaterally, tongue protrusion was reduced, and uvula was shrunken [Figure 2]a and [Figure 2]b. Mouth opening was 22 mm on her first visit (Stage II). She was partially edentulous. Following systemic administration of 1500 mcg of lycopene and 10 intralesional injections biweekly, her mouth opening increased (measuring 29 mm) and burning sensation reduced subsequently [Figure 2]c. Patient is under follow-up and is under lycopene and mouth opening exercises. Patient was partially edentulous and was advised fabrication of prosthesis, but due to decreased mouth opening she is still under follow-up. A 32-year-old male patient reported to the department with a burning sensation in the mouth. He gave a habit of areca nut chewing for 5 years occasionally [Figure 3]. He did not provide any significant medical history. 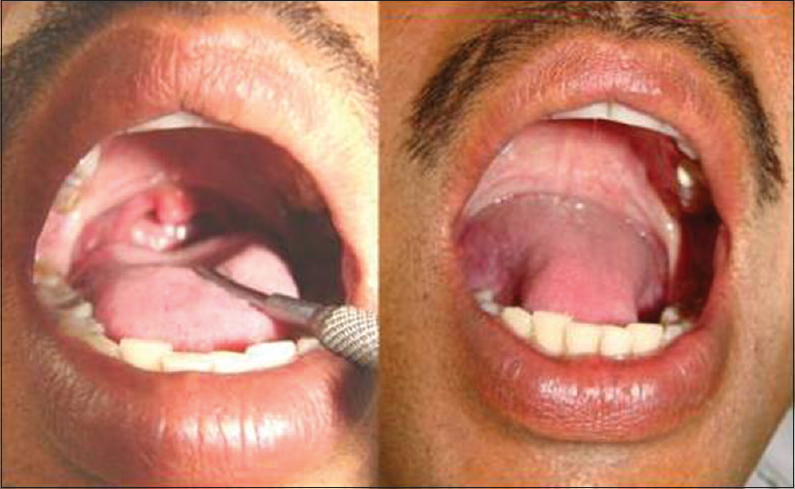 On intraoral examination, fibrous bands were palpable bilaterally and tongue protrusion was significantly reduced. His mouth opening was 26 mm when he first reported to us (Stage II). He was advised lycopene 1500 mcg for 15 days prior to the intralesional injections. His mouth opening has significantly improved (measuring 32 mm) and burning sensation reduced over 10 intralesional injections over 3 months. He is under follow-up and on 1500 mcg lycopene daily and is doing opening exercises daily. OSF was first described in the early 1950s. It is a potentially malignant disease with 7–13% of OSF patients developing head and neck squamous cell carcinoma. It is regarded as a collagen metabolic disorder with an overall increased collagen production and decreased collagen degradation, resulting in increased collagen deposition in the oral tissues and fibrosis due to alkaloid exposure. Clinical importance of OSF is due to two reasons, namely, (1) it is a disease that results from the use of betel-nut chewing in Indians as well as other nationalities adopting the oral habit of betel-nut chewing and (ii) it is generally accepted to be a premalignant condition of the oral cavity. Main contributing factor, as thought by Jayanthi et al., is the use of areca nut, tobacco, and crude lime wrapped in betel leaf. Experimentally, an alkaloid component of the areca nut, “Arecoline,” can induce fibroblast proliferation and collagen synthesis and may penetrate the oral mucosa to cause progressive crosslinking of collagen fibers. The direct contact of the quid mixture with oral tissues results in their continuous irritation by various components, including biologically active alkaloids (arecoline, arecaidine, arecolidine, guvacoline, guvacine, flavonoids, tannins, and catechins) and copper. Other factors, such as genetic and immunologic predisposition, probably also play a role as OSF has been reported in families (both children and adults) whose members are not in the habit of chewing betel quid or areca nut. The symptoms and signs of OSF are due to inflammation and, primarily, fibrosis. The most common initial symptoms and signs are a burning sensation, dry mouth, blanching oral mucosa, and ulceration. The burning sensation usually occurs while chewing spicy food. Blanching of the oral mucosa is caused by impairment of local vascularity because of increasing fibrosis and results in a marble-like appearance. Blanching may be localized, diffuse, or reticular. In some cases, blanching may be associated with small vesicles that rupture to form erosions. Patients complain that these vesicles form after they eat spicy food. These features can be observed at all stages of OSF. In the more advanced stage of the disease, the essential feature is a fibrous band restricting mouth opening and causing difficulty in mastication, speech, swallowing, and maintaining oral hygiene. Development of fibrous bands in the lip makes the lip thick, rubbery, and difficult to retract or evert; a band around the lips gives the mouth opening an elliptical shape. Fibrosis makes cheeks thick and rigid. When a patient blows a whistle or tries to inflate a balloon, the usual puffed-out appearance of the cheeks is missing. In the tongue, depapillation of the mucosa around the tip and lateral margins may occur with blanching or fibrosis of the ventral mucosa. Fibrosis of the tongue and the floor of the mouth interfere with tongue movement. Hard palate involvement includes extensively blanched mucosa. Fibrosis may extend posteriorly to involve the soft palate and uvula. The latter may appear shrunken and, in extreme cases, budlike. Gingival involvement is relatively uncommon and is characterized by fibrosis, blanching, and loss of normal stippling. In rare cases of extensive involvement, there may be loss of hearing due to blockage of eustachian tubes and difficulty in swallowing because of esophageal fibrosis. Various classifications have been purposed depending on the clinical features such as by Wahi et al. (1966) who classified OSF on the basis of clinical features, severity, and extent of involvement into three clinical groups; another classification was bySirsat and Pindborg (1967) who classified the histological picture of OSF into four stages. Lai et al. classified patients on the basis of mouth opening. We have staged our patients as per the classification of Lai et al. No known treatment for OSF is effective, although some conservative and surgical interventions may result in improvement. Most important aspect of medical treatment is the cessation of habit of eating betel quid, areca nut, other local irritants, spicy and hot food, alcohol, and smoking. The most common mode of medical treatment had been the use of steroids in its various forms. Other methods include injection of placental extract, use of trypsin, collagenase, hyaluronidase and elastase, and intralesional Interferon-γ (IFN-γ).,,,,, Oral zinc as well as oral pentoxiphylline  and lycopene have been used with varying benefits. Despite much progress in understanding the pathogenesis and treatment of OSF in the absence of properly designed trials and lack of standardized doses and duration of treatment, we had standardized and recommended the treatment in our cases. The list of treatment modalities is extensive and includes the use of micronutrients and minerals, CO2 laser, pentoxifylline, lycopene, interferon gamma, turmeric, hyalase, chymotrypsin, and placental extracts. As fibrosis cannot be reversed when mouth opening is severely reduced, surgical interventions such as myotomy, coronoidectomy, and excision of fibrotic bands have also been reported in literature. Alternatively, procedures such as insertion of stent, physiotherapy, local heat therapy, and mouth-opening exercises with acrylic carrots and icecream sticks have been tried with variable success rates. Kakar et al. reported that patients treated with hyaluronidase showed quicker improvement in symptoms but a combination of corticosteroids gave better and long-term results. Steroids are well known immunosuppressive agents for suppression of fibroproductive inflammation found in OSF. Hyaluronidase degrades the fibrous matrix promoting the lysis of fibrinous coagulum and activating specific plasmatic mechanism. Relief of symptoms of stiffness in oral cavity occurs through softening and diminishing fibrous tissue.,, In the above reported cases intralesional corticosteroid injection with injection hyaluronidase was given once a week to make the treatment cost-effective and for better patient compliance. The patients showed relief of symptoms of burning sensation, hypersensitivity to spicy food, and oral ulceration along with a subjective sense of reduced stiffness in buccal mucosa after administration of injections biweekly for 2 months. The cases illustrate the significant morbidity and mortality associated with OSF and emphasize the importance of close follow-up of such cases. Because of the significant cancer risk among these patients, periodic biopsies of suspicious regions of the oral mucosa are essential for the early detection and management of high-risk oral premalignant lesions and prevention of cancer. McCullough MJ, Prasad G, Farah CS. Oral mucosal malignancy and potentially malignant lesions: An update on the epidemiology, risk factors, diagnosis and management. Australian Dental Journal 2010;55(1 Suppl):61-5. 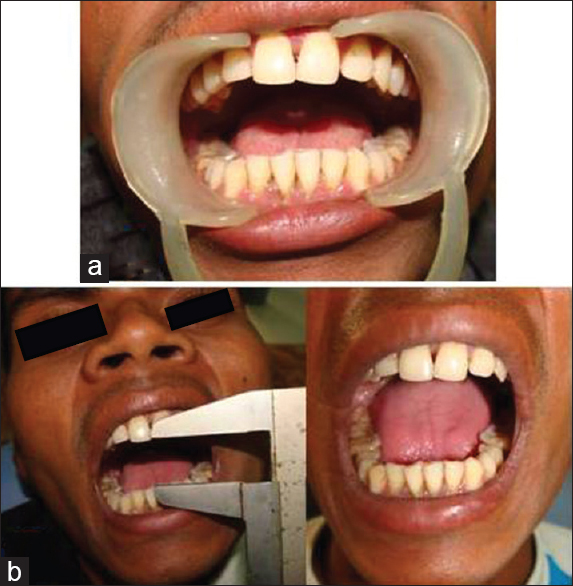 Afroz N, Hasan SA, Naseem S. Oral submucous fibrosis: A distressing disease with malignant potential. Indian J Community Med 2006;31:270-7. Auluck A, Rosin MP, Zhang L, Sumanth KN. Oral submucous fibrosis, a clinically benign but potentially malignant disease: Report of 3 cases and review of the literature. J Can Dent Assoc 2008;74:735-40. Jayanthi V, Probert CS, Sher KS, Mayberry JF. Oral submucosal fibrosis-- A preventable disease. Gut 1992;33:4-6. 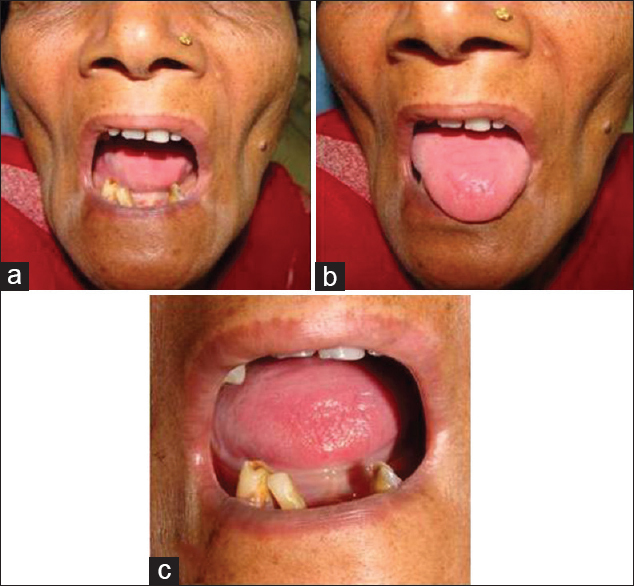 Chitturi RT, Kumar VA, Naik P, Kattimani V. Oral submucous fibrosis– An Indian perspective. Research 2014;1:702. Gupta L, Gupta N, Punn K, Chandel S. Oral submucous fibrosis: A clinical note. Asian J Oral Health Allied Sci 2011;1:229. Wahi PN, Kapur VL, Luthra UK, Srivastava MC. Submucous fibrosis of the oral cavity. 2. Studies on epidemiology. Bull World Health Organ 1966;35:793-9. Rao V, Raju PR. Treatment of SMF with cortisone. Indian J Otolaryngol 1954;6:81-3. George AT. Submucous fibrosis of the palate and buccal mucosa membrane. J Indian Med Assoc 1958;31:489-90. Hamner JE 3rd, Looney DD, Chused TM. Submucous fibrosis. Oral Surg Oral Med Oral Pathol 1974;37:412-21. Kakar PK, Puri RK, Venkatachalam VP. Oral submucous fibrosis- Treatment with hyalase. J Laryngol Otol 1985;99:57-9. Singh M, Niranjan HS, Mehrotra R, Sharma D, Gupta SC. Efficacy of hydrocortisone acetate/hyaluronidase vs triamcinolone acetonide/hyaluronidase in the treatment of oral submucous fibrosis. Indian J Med Res 2010;131:665-9. Rajendran R, Rani V, Shaikh S. Pentoxifylline therapy: A new adjunct in the treatment of oral submucous fibrosis. Indian J Dent Res 2006;17:190. Rajalalitha P, Vali S. Molecular pathogenesis of oral submucous fibrosis – A collagen metabolic disorder. J Oral Pathol Med 2005;34:321-8.